There is no doubt that decision making plays a pivotal role in people’s lives and that increasing decision-making competence can have a profound positive impact. The focus of this chapter is primarily upon interpersonal decision making, which is central to maintaining a positive quality of life but which poses particular challenges to people with intellectual and developmental disabilities. Interpersonal decisions are at the crux of the social vulnerability of people with intellectual and developmental disabilities. Research to better understand and strengthen interpersonal decision making offers a potential avenue to reducing social vulnerability and increasing positive quality of life. 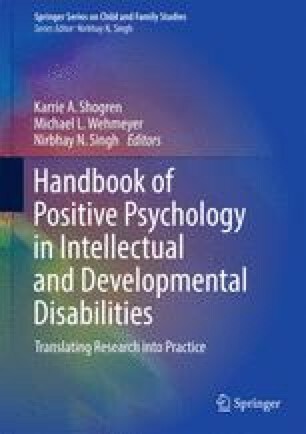 In accord with the tenets of positive psychology, the premise of the chapter is that enabling people with intellectual and developmental disabilities to acquire a repertoire of effective interpersonal decision-making skills can provide them with a powerful tool for building positive, satisfying friendships and intimate relationships as well as for ensuring their own personal safety and preventing harm. This chapter includes a brief description of a working model of four pathways to effective decision making as well as a review of some key decision-making research and intervention studies as well as evidence-based curricula aimed at providing adults and adolescents with intellectual and developmental disabilities with a useful repertoire of decision-making skills. This chapter concludes with suggestions for future directions for research and practice in decision making.